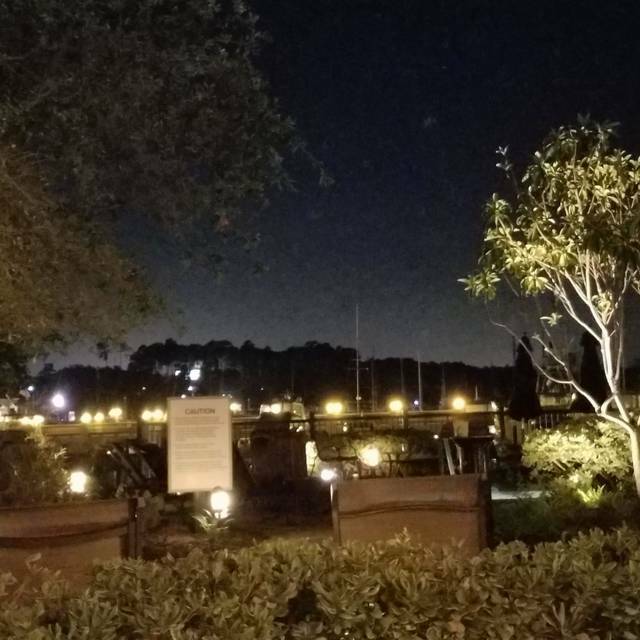 You must make reservations at least 5 minutes in advance of the time at WaterScapes Restaurant at the Marina Inn at Grande Dunes. Complimentary valet or self parking available on site. WaterScapes Restaurant offers several options for private dining as well as special events such as weddings, receptions, anniversaries and meetings. In addition to the WaterScapes Main Dining Room, there are several indoor and outdoor choices on-site that will accommodate up to 700. 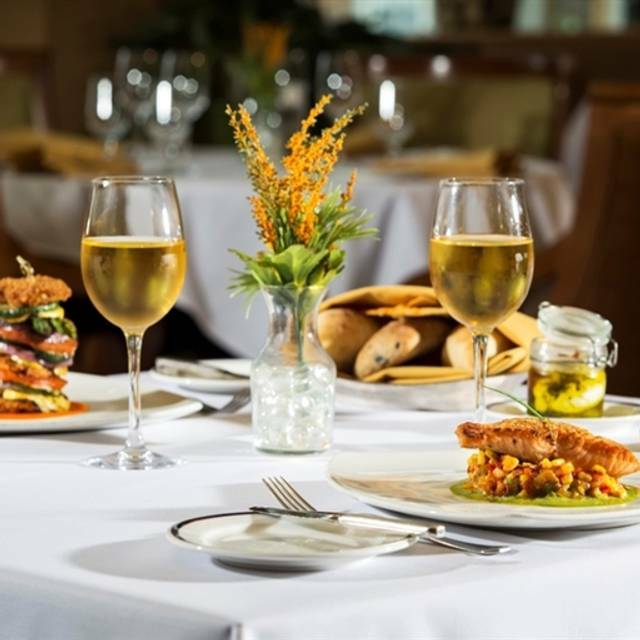 Visit Chef Rourk at WaterScapes Restaurant where he combines his own classically trained French cooking style prepared with a southern American twist. Enjoy inside or outside dining Myrtle Beach on the patio overlooking the pool and marina. Try some of favorites such as Grilled Local Shrimp with Anson Mills Grits, Grilled Filet Mignon, Chargrilled Ribeye, Pan Seared Diver Scallops and more! WaterScapes is located inside the AAA four diamond Marina Inn at Grande Dunes and offers a unique atmosphere blending elegant yet casual ambiance offering indoor seating as well as outdoor terrace seating with views of the Grande Dunes poolscape and marina. Dress is resort casual and parking is free at the Marina Inn at Grande Dunes. as were desserts. We were all very pleased with the entire meal. Our waiter Chris was terrific. Food was lovely and the drinks were unique and tasteful. Wish we were outside but the rain didn’t cooperate. We will return and recommend this place! Very disappointing. Had been there in prior years. Food quality has gone down. Friendliness and service was mediocre. Too many great choices in Myrtle Beach. Won't be back to Waterscapes. We love the atmosphere, music they play, service, great wine, and they cook your food however you want...delicious steak...hot bread with olive I’ll, herbs and got cheese to dip it in...fabulous salt caramel gelato! Love it there. Outdoor seating in nice weather. Assumed because called Waterscape seating was by water or view of water or there are fountains. None - didn't make sense. Overall , good, simple Valentine's Day menu. Terrific service. We had a party of 4, two of the party members were vegetarian and the were very please with pasta selections. My husband had a fillet that he said melted in his mouth and I decided I will only have crab cake small plate because it was getting late and I wanted something light. Food was of very good quality, restaurant was clean and quiet, staff was very friendly and service was excellent. We will definitely visit WaterScapes again and will absolutely refer friends there. Desserts were fresh and they have some other meals I would like to try. Disappointed!!! So boring hopefully more atmosphere in season and outside dining but so empty and so boring on this night ! Birthday lunch. Excellent food and one of the best restaurants around. First visit here even though I’ve been living here 2 years. Pleasantly surprised. Will definitely return.
. Service was good and the food was excellent. Very quiet and enjoyable. We went for restaurant week and loved it. We will definately go back! This was our second time. Our waitress Sharon is fabulous . She can’t do enough to please you. She made our Dirty Martini to perfection, I needed a little mor Vodka in mine, no problem. Our dinner was out of this world! New try was a shrimp appetizer, a little spicey but I want it as an entree. Our Filet , 10 Oz, of course was spectacular. Cooked perfectly. The prices are unbelievable. We also had a coupon from the Sunday paper for 30%! Our new big find. It’s a little secluded, inside a Bid hotel but definitely a good reason to look for it. Went with friends both times! Service was great but disappointed with food quality. Our starter and dinner were too salty and salmon did not seem fresh. It was our anniversary and no one said anything until we were leaving the restaurant. Very Quiet! Had a Wonderful dinner on Christmas with friends! Christmas Eve dinner was excellent and the wait staff also attentive, cordial and friendly. One of our favorite places! Very nice interior. Food was good, although not outstanding. Though "fine dinning", it just didn't check all the boxes. Could be better on all levels. Waitress Sharon was fabulous, so accommodating. We both had the 10oz Filet Mignon, it was cooked perfectly. We switched out potatoes for extra veggies with no problem. Dessert was their specialty Bourbon Bread Pudding, OMG, can’t wait for that again. We tried it on a coupon but will go back over & over. Sharon was our server and made the evening so enjoyable. Food was great as usual. Don't know why it's not always full but we enjoy the quiet ambience. My wife and I celebrated our 51st anniversary with you. Sadly, this was our first time to your restaurant and we live close by !! It will not be our last. Food selections were wonderful. Sharon, our server was more than willing to work with us on selections. The rest of your staff came by and wished us a happy anniversary, which we thought was so nice. We realize, it was quiet !!!! Sunday before Thanksgiving? Food was wonderful, dessert divine. Was looking for an upscale restaurant to end our long weekend in MB. While this was reviewed as upscale, it really wasn't. It worked out for us because we were really tired and not too hungry so we decided to go as is (not jeans, but not "business casual"). That was good as I would have been highly upset if I made an effort to dress (no one else was "dressed"). First, the location is horrible. It is in the basement of a hotel--creepy. Small and really more like a smallish hotel restaurant than what I would expect as an "upscale" restaurant. It has seen better days (carpet, chairs, etc. a bit warn). In any event we decided to split a Chicken Marsala dish which was very very good. Afterwords we said we probably could have eaten a whole meal each as it was that good. All in all, OK. But, I'd guess for a truly upscale dressy place, there are better options. Quiet and elegant setting in an upscale hotel. Enjoyed one of the best renditions of shrimp and grits I have ever experienced. Cocktail could have been better. Why do so many bartenders insist on shaking a Manhattan so vigorously that the drink contains ice chips and tastes watery even when you order it straight up? Nonetheless, I was extremely pleased overall, as were my companions. We were looking for an upscale place to eat and found it. The food was excellent and the service outstanding. Thank you. Everything about our stay and meal was excellent! I would definitely recommend this place. I would also come back. We enjoyed a very romantic dinner. I've been vacationing in Myrtle Beach once or twice a year since 2010 and have tried many of the fine dining restaurants. This was probably the best meal I've had in MB. Every course exceeded expectations - from the freshly baked bread with herb & goat cheese infused olive oil, to the salad, entrees, and chef's variation of key lime pie. However, while the food deserves a 5 star rating, and our server was decent, the restaurant was almost empty on a Saturday night. It was a beautiful evening so my husband and I opted to dine outdoors. We were the only ones outside and rather than the hostess seating us at the table with the best view, she sat us at one of the two that had been set up. Additionally, while the food is excellent, the menu is extremely limited which is the primary reason I never chose to dine there before. Lastly, I would expect a restaurant with this caliber of food to offer a better wine selection. Server was okay but unprofessional. Of four adult meals, one was unacceptable and two were unsatisfactory. Wine was good. A couple walked out just before our meals were served. Manager attempted to resolve our complaints. We went to Waterscape for dinner The food was soooo delicious and the service was excellent. Stefani was polite, kind, and informative which made our experience much more enjoyable. Couldn't have asked for a better dining experience. Great food, beautiful environment, and the best waitress/bartender around. Made us feel very comfortable and great sense of houmor. Very disappointed in a restaurant we had heard was supposed to be very good. Service was very slow even though we were one of only 3 tables in the whole restaurant and there were 3 servers. Food was good but not worth the price. Fried oyster appetizer special were very salty and over breaded. Risotto appetizer wine had not been cooked off. 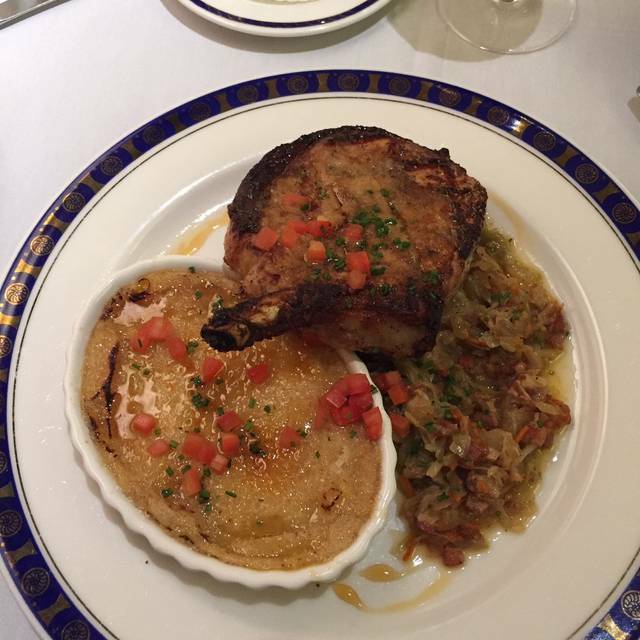 Corn pie with pork chop was too sweet and pork chop ordered medium was well done. 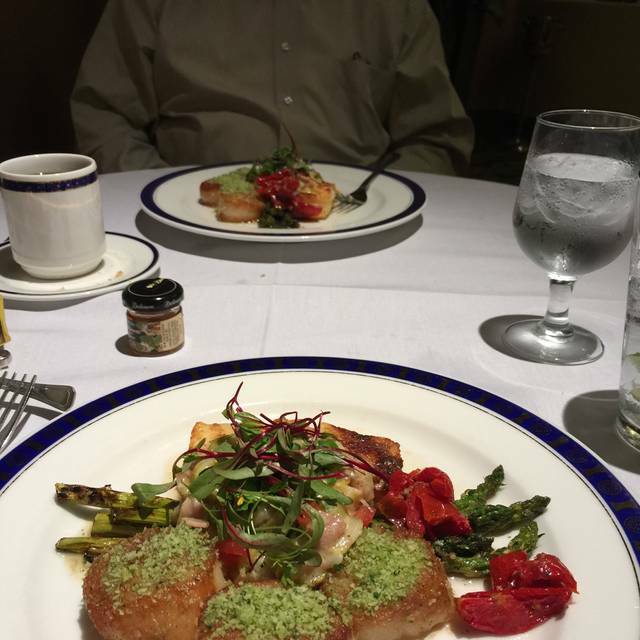 Great service, nice atmosphere, friendly staff and delicious filet mignon! 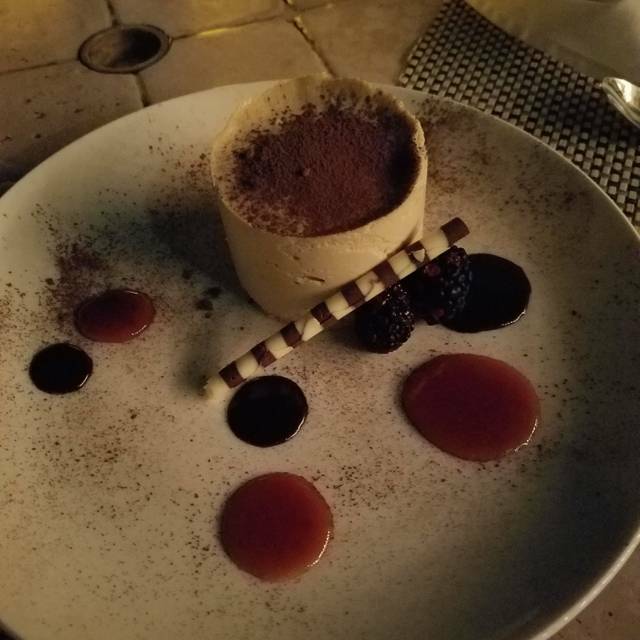 Great dessert. Outdoor seating was nice with the view of the marina. Food was a tad bit expensive. Very good food, but that’s expected at the prices. Excellent service, nice ambiance. Very enjoyable. Menu on google was also totally out of date and they didn’t offer anything on that menu stil. Great staff which is the first ingredient. The check-in lady was very nice and Stefani looked after us very well. Food was excellent even though the executive chef was off for the evening. Great job well done.